Among the limited research we currently have about the impact of chaplain care on important patient outcomes is the evidence of the positive impact of chaplain care on patient and family satisfaction with care. Consistent with this prior research, the article we discuss in this webinar reports higher ratings of satisfaction among patients who received at least one chaplain visit compared to those who were not visited by a chaplain. Prior studies have often relied on patient self-report of chaplain visits. This study improves on that research by using chaplain care documented in the electronic medical record. The six satisfaction measures in this study were taken from both the Press-Ganey Survey and HCAHPS. Because HCAHPS scores are among the measures now being used to calculate incentive payments in Medicare's Hospital Value-Based Purchasing program a case can be made, as these authors suggest, for the "positive fiscal consequences"Ã‚Â� of chaplains' care. In this session we will review the strengths of this study as well as its important implications for making the case for the benefits of chaplains' care. Colleagues from your Patient Experience or Quality Improvement departments may be interested in joining you for this webinar. 1. 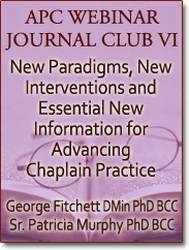 To introduce chaplains to new evidence that chaplain care is associated with greater patient overall satisfaction with care. 2. To help chaplains understand the importance of this evidence for making the case for chaplains in the context of Medicare's Value-Based Purchasing. 3. To help chaplains develop and maintain research literacy, including the ability to critically read research and, where appropriate, apply the findings in their professional practice.